Veterans Day. Everyone has a part, helping or riding. Families prepare all week. Veterans groom their horses so even the hooves shine. Soldiers from any war or conflict—both women and men—clean and polish tack, get uniforms out, and prepare to ride. Before sunrise I fed the horses that would stay behind, old Chaco and Bandit. Extra hay for Bandit now, her sides already a little swollen. Good job, Blue. When Gaby comes home, a little foal—a part of Blue—will be here to greet her. Maybe he’d be a colt, a beauty like Blue. I stood outside and looked across the mesa. It was still dark, but lights were on in most of the homes and hogans. Soon at each ranch, including ours, riders would mount their horses. Off they’d go, riding across the washes and arroyos, over sand dunes and rocky red paths, toward the chapter house, the official governing and gathering place of each community. Along the roads, families would be waiting and watching, eager to be the first to spot a horse and rider. Kids would put up hand-printed signs: Free coffee and doughnuts for veterans. 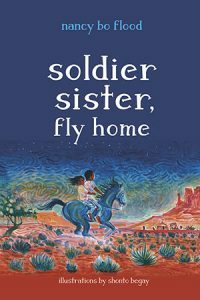 –From Soldier Sister, Fly Home.